candy cane girl, don’t you know my name girl? I try instead to remember small things, like Tim and I amusing ourselves at a cafe by bags-ing clothes we liked from passers-by and the windows in the shop opposite. A person walking a dalmatian dog passed by and I hissed “Be cool” and Tim waved at the dog enthusiastically and I was all we so get each other (although depending on your stance this anecdote could also fall into the les incompetents category.) Like friends who instinctively invite themselves round for wine just when you feel like friends and wine. Like getting a tweet reply from people in The Wire or on Broadway. And like this utterly manageable Christmassy snack to go with my Christmassy movie reference. It has less ingredients than I have eyelashes after a night wearing mascara (seriously, mascara is like a tiny version of one of those weird rolly things that remove lint from your clothes…for my eyelashes) and – the snack that keeps on giving – is also charmingly simple to make, strangely delicious to eat, and aggressively festive to behold. So, yes, this conversation again – I didn’t win the blogger award I was nominated for. D’oh! I feel like the Raul Esparza of blogger awards. But you can’t go round hitching your wagon to every star that rolls by. Had I won, of course, I would’ve talked about it heaps, and big congratulations to the winner. But here we are. Asking for votes isn’t something I love, and while I didn’t quite have the energy to be involved, I also didn’t have the energy not to be involved, if that makes sense. On the upside of things, it’s cool that someone/s nominated me, thanks heaps everyone who did vote because of – or in spite of – my petitioning, I’m pretty sure I got some new readers out of this (do stay!) and it’s a good learning experience. So what even is this recipe? It’s so simple, and yet a triumph of both texture and flavour. The sugary crunch against soft chocolate snap; the spicy chill of synthetic peppermint flavouring melting into the cocoa darkness. While I have a feeling I’ve seen this recipe before somewhere other than my brain, I also can’t place it specifically. That said, I haven’t tried googling it or anything. But importantly, it’s easy, it’s delicious, it’s beautiful. In fact the most difficult part is wrangling the wrapping off the candy canes – this strange plastic, which on the candy canes is like trying to scrape off a layer of clear nailpolish, and then when finally removed it floats around and clings obstinately to your eyebrows. 1 tablespoon coconut oil or plain oil (I like rice bran) or even Kremelta, if you dare. 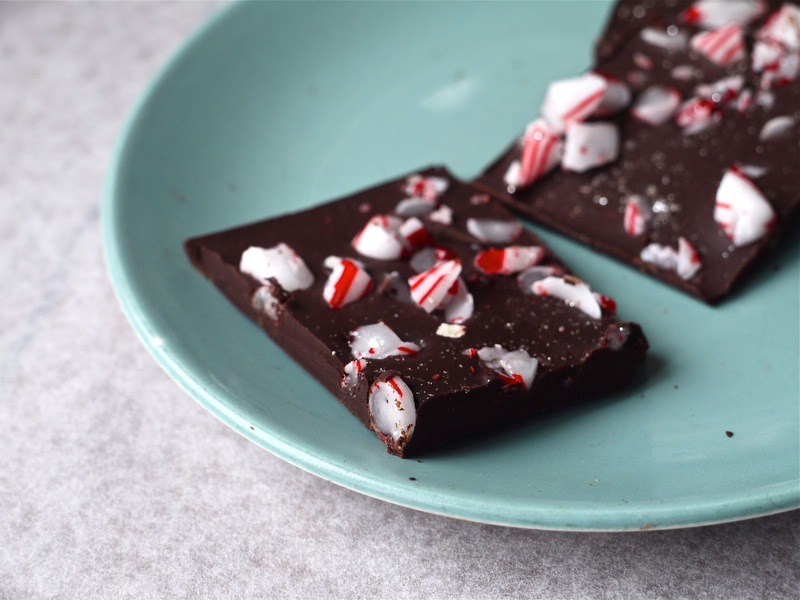 Place the unwrapped candy canes on a chopping board, and carefully, using a big knife, chop away at them till they’re reduced to peppermint splinters. Melt the chocolate, a decent grind of salt, and the oil together gently either in the microwave or in a metal bowl that’s sitting on a small pot of simmering water (not actually touching the water.) Pour into a smallish tin – if it’s silicone you’re all good, but consider lining it with baking paper if it’s ceramic or metal or something. 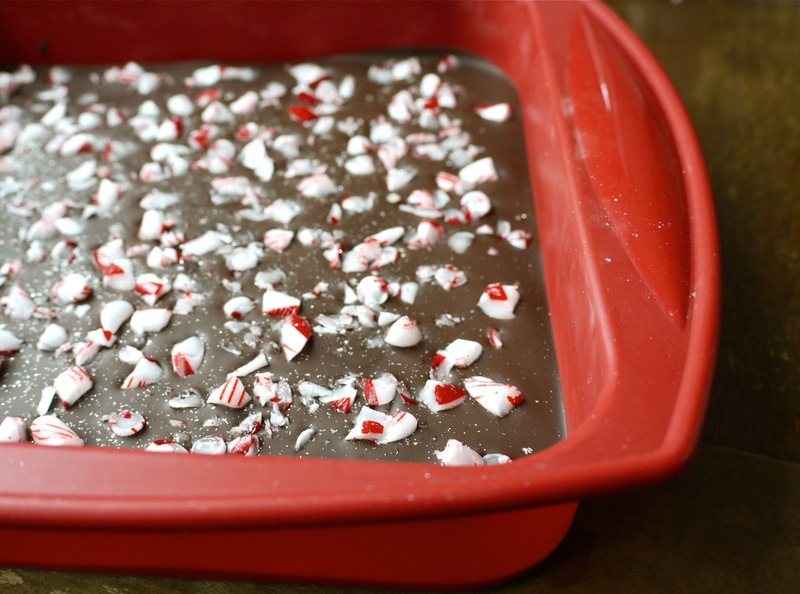 Once it has cooled a little, sprinkle the candy cane shards over evenly and top with glitter. Chill and slice evenly. This is best when freezing cold, to encourage maximum crunch and minimum melting in your hand. Also good topped, if you will, with a tasteful and elegant dusting of edible glitter. 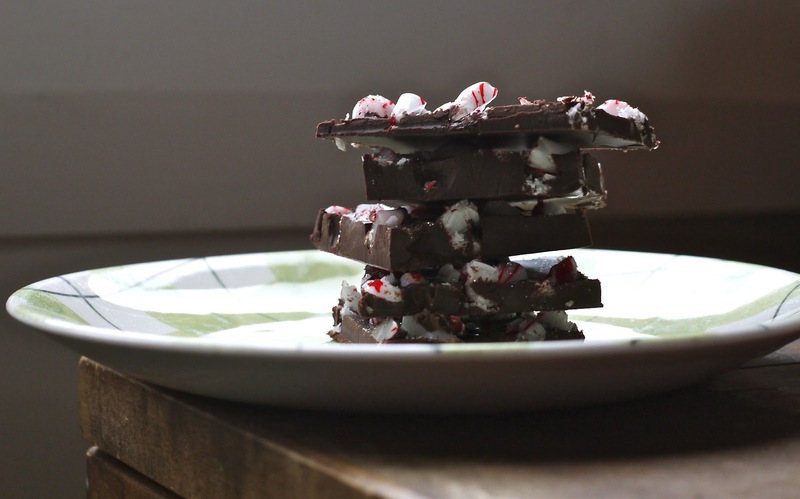 You could double the chocolate, to make it thicker, or double the candy canes, to make it crunchier and prettier. Don’t leave out the salt – I know salted everything these days is getting a little blah, but its intensity not only balances out the sweetness, but also makes everything taste more of itself. Candle in the background. So meaningful. Every time I’m convinced peppermint flavouring is as fun as eating food right after after cleaning your teeth, a combination like this comes along to change my mind. While it looks like it’d make an ideal gift, it’s a little too melty to be sit around in a wrapped box for hours under the tree. Instead, whip it out when you’ve got guests and they’ll hopefully be so dazzled by the pretty shards of candy cane, that you’ll look far, far more competent than you might be feeling. Finally, I don’t know how many times you’ve seen Home Alone but that’s what the Les Incompetents quote comes from – I was talking to someone on Twitter about how I’d wanted to use it on my blog for a while, and lo, the universe provides me with lots of incompetency to not so much quote it as turn it into a thematic motif for my life, or something. Yay for Twitter – even though I’ve only met this person a few times, I can say sincerely, this one’s for you, @Sakura_59! Title via: People, there are just not that many songs referencing candy canes, which makes no sense to me. Luckily the White Stripes not only made a song, they basically devoted their working life to resembling peppermint-flavoured candy. Ladi6 released a beautiful video for her beautiful song Jazmine DL. She’s so awesome I can’t even talk about her properly without a good night’s sleep so I’ll just link through to the video and leave it at that. The song that always, always makes me feel better, but especially during an attack of the les incompetents: Die, Vampire, Die. "and altogether quite impossible to describe…." "blonde". But um, err, at least you've made it onto Tastespotting, right? If you're feeling down, just consider what Special Agent Cooper would do were he in your position. Would he think of Tibet? Maybe. I'm re-working my way through the series so my boyfriend can watch it for the first time. It'd been a while since your cherry pie post, I figured a good Coop ref might bring a smile your way. I don't think I could eat this, I have had my eensy weensy fill of peppermint in the past week, so I'm good for the next year or two. But I bet something along the lines of candied fruit peel could go nicely on this in lieu of the mintymint. I'm weak. This looks delicious! I did a chocolate/candy cane/ glitter thing last Christmas, but it was a fudge. Can't be arsed this year. Laura this makes Christmas mood! Y'know, if you ever need to hug a large cat, there's always at *least* one at my place. And you are always welcome. Also, did we actually sing Wuthering Heights? Good for us! Wow that looks super yum! 🙂 I miss candy canes – they don't seem to be as prevalent here in London as they are in NZ. Must work out how I can get my hands on some! ps. your candy cane and chocolate pictures look beautiful but i am unable to chew currently (wisdom tooth) so I am skipping over reading that part as I am just hungry for some solid bread…anything solid really. (as long as its food). 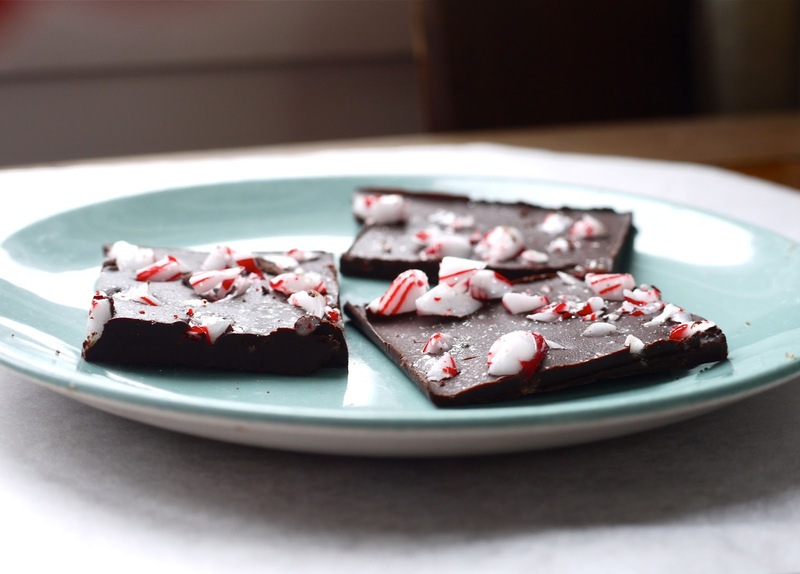 Love chocolate bark – so delicious! Emma, you are in hot competition with Hannah for “the best”. Reminding me of sweet Special Agent Cooper has done wonders for my happiness. And I *do* like the idea of throwing other things on top instead of candycanes. Candy canes don't go off, right? I have one candy cane sitting on my desk from last Christmas (I never eat those things!) and plenty of chocolate… I feel a mini, personal-sized batch of these will be just the way to use it up. With friends like you, chocolate treats like this, and big fluffy cats to cry on like you've described, I could cope with a lash-less life. That made more sense in my head. I do this with a layer of white chocolate on top of the dark, which makes it look even more festive (and totally delicious). (I think it's called Peppermint Bark and is USian, fwiw.) I find it surprisingly delicious – like, significantly more than the sum of its parts. I have no words to offer for your up and down moods, as mine are rather rollercoasterish too, of late, so I shall just offer random-internet-stranger smiles and love. <3! 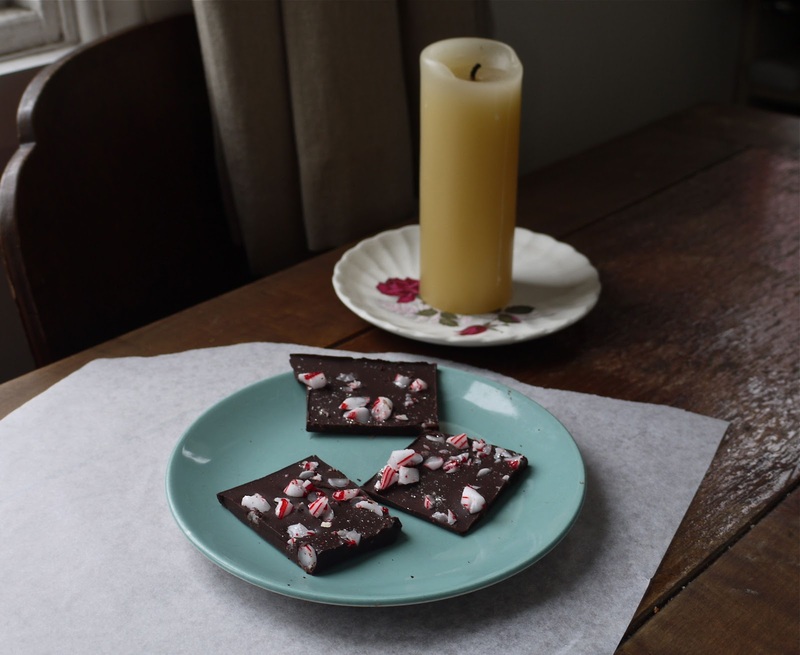 Oh yum….chocolate & peppermint a delightfully festive sugar come chocolate rush.